In the theology of the Orthodox Church man is made in the Image of the Most-holy Trinity, and, except in certain special cases (such as monasticism, for example), he is not intended by God to live alone, but in a family situation. Just as God blessed the first humans, Adam and Eve, to live as a family, to be fruitful and multiply, so too the Church blesses the union of a man and a woman. Marriage, however, is not a state of nature, but is rather a state of grace, and married life is a special vocation (no less than the special calling of monasticism), requiring a gift or charism from the Holy Spirit — this gift being conferred in the Sacrament of Holy Matrimony. The Holy Apostle Paul sees this mystical union of husband and wife as reflecting the mystical union of Christ with His Church: Wives, be subject to your husbands, as to the Lord. For the husband is the head of the wife as Christ is the head of the Church, His body…. Hus-bands, love your wives, as Christ loved the Church and gave Himself up for her…. Even so hus-bands should love their wives as their own bodies. He who loves his wife loves himself. For no man ever hates his own flesh, but nourishes and cherishes it, as Christ does the Church, because we are members of His body…. This mystery is a profound one, and I am saying that it refers to Christ and the Church… (Eph. 5:22-25, 28-30, 32). The Office of Crowning also contains an Old Testament element in the crowning itself, which reflects the ancient practice of placing crowns on the heads of the betrothed. This is the outward and visible sign of the Sacrament, signifying the special grace of the Holy Spirit re-ceived by the couple. These crowns are crowns of joy and martyrdom — joy for the new union and martyrdom since every true marriage involves immeasurable self-sacrifice on both sides. The Gospel for the day contains the account of the Wedding in Cana in Galilee (John 2:1-11). The blessing, given by God to man in Paradise was renewed by Christ in the New Testa-ment, when, at the beginning of His ministry, He performed the miracle of changing water into wine. Thus, at the end of the Marriage Service the newly-married couple drink from the same cup of wine, which recalls this miracle of Our Lord. The common cup here is also a symbol that henceforth they will share a common life with one another. 1. On the Eves of Wednesdays and Fridays throughout the year. 2. On the Eves of Sundays throughout the year. 3. On the Eves of the Twelve Great Feasts, patronal feasts of the parish or monastery, and other great feasts. 4. 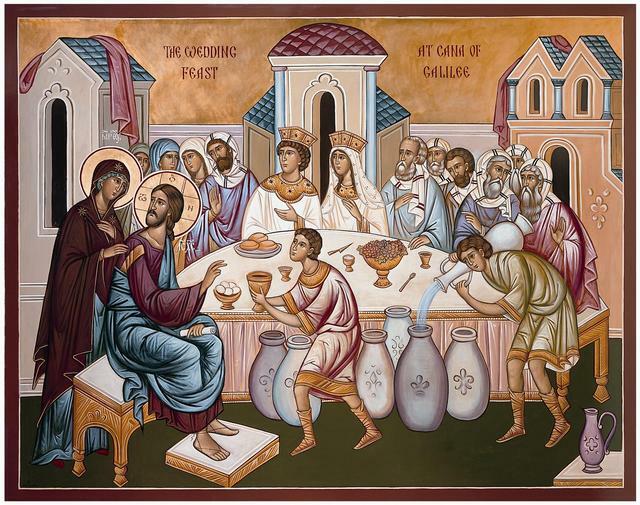 In all of the Fasts (Great Lent, Apostles’ Fast, Dormition Fast and Nativity Fast). 5. From the Nativity of Christ (Dec. 25) through the Synaxis of the Baptist (Jan. 7). 6. During the course of Cheesefare Week (from Sunday of Meatfare through the Sunday of Cheesefare). 7. During the course of Bright Week. 8. On the Day and the Eve of the Beheading of the Baptist (Aug. 29) and the Elevation of the Cross (Sept. 14).